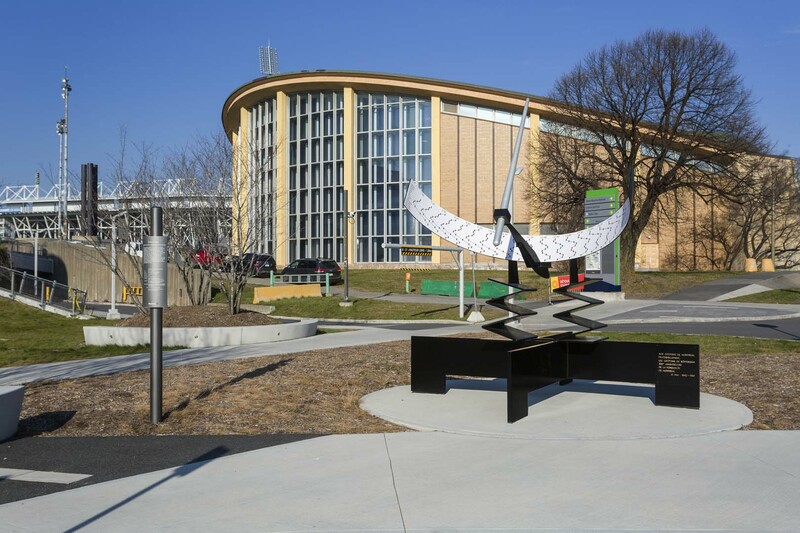 Initially installed in Square Chaboillez in front of the Dow Planetarium, the sundial was relocated and restored in 2013, when the planetarium was moved to Espace pour la vie. Today, the artwork is situated in front of the new Rio Tinto Alcan Planetarium and is linked to its educational activities. The sculpture is composed of a black-painted cross-shaped steel base, on which two accordion-folded sheets of black-painted steel are placed. These elements support the semi-circular dial (hour plate). The hour plate is also made of black-painted steel. The aluminum dial is attached to the top face of the plate. The 21 hour lines (from 7:00 to 17:00 in half-hour increments) are composed of black rectangles linked by grey lines indicating the time according to the month. At the two ends of the dial, the months are inscribed in black. The stylus, an anodized steel rod, is installed in the centre of the plate and points northward at an angle of about 45°. The shadow projected by the stylus on the graduated plate of the dial gives the time in Eastern Standard Time. 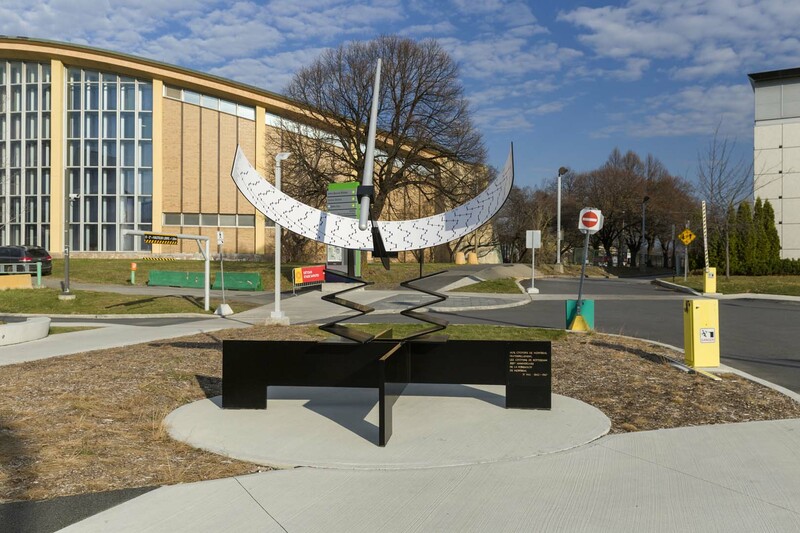 Although inspired by traditional sundial-building techniques, the artist wanted to create an original artwork that is both artistic and functional. The equatorial-type sundial thus rigorously respects gnomonic rules. 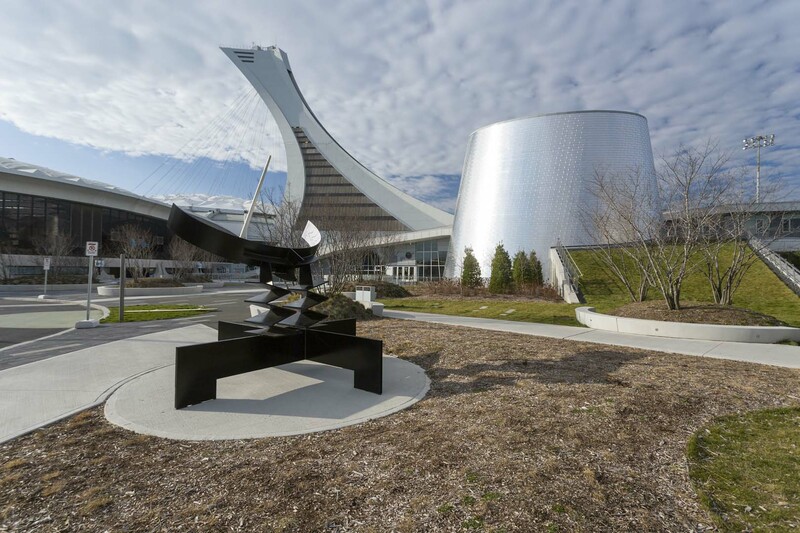 The monumental artwork titled Cadran solaire was presented by Rotterdam to Montréal on the occasion of the 325th anniversary of the founding of Montréal, in 1967. Herman J. van der Heide, a Dutch sculptor, was born August 12, 1919, in Sneek, the Netherlands, and died in 1998. During the Second World War, he took night courses in drawing and painting at the Minerva de Groningen Academy; later, he studied at the Free Academy in The Hague. A self-taught sculptor, he was, among other things, an interior decorator for various corporations. In 1947, he moved to Amsterdam, where he lived until 1955 and worked as an exhibition organizer. He then taught at the Royal Academy of Visual Arts in The Hague and acted as an urban planning and architecture consultant for the city of Amsterdam. His works fall within the constructivist current.